Facing reality after living life at Glastonbury for 5 days is one of the trickiest things to date. The sweltering heat on Wednesday took everyone by surprise- if you were there too you realised just how hard it is to stay cool with no actual shade anywhere. Once the tent was set up you had your very own private sauna. Passing through security and having the mesmerizing wrist band clamped over your arm, lets you welcome the buzz that takes over your body when the realisation sinks in – you have arrived in Glastonbury! This is only the beginning of the best 5 days of your life. Looking over the field and seeing only a select few tents pitched up is a daunting feeling, knowing as the minutes pass on by you will have to trek to find the perfect spot for you and your pals to set up your home. No one could have warned me how amazingly massive the festival is, having to walk from Arcadia to the Pyramid stage back again to Shangri-La (to name my few favourites) took it out of you, but the pure joy of Glastonbury gave you the energy boost needed. Setting up camp 15ft away from The Other Stage factored in to making it the most memorable, enjoyable week of my life. There is no way your imagination could even slightly begin to describe the atmosphere, the vibrant decorated stages, the happiness you feel waking up in the morning in a dirty, smelly tent but just knowing you are at Glastonbury, is enough to make you smile like a Cheshire cat. Want to see some live footage from Glastonbury’s very own pyramid stage? Click on “>this link to see our Facebook Live from Glastonbury 2017. PACK LIGHT – most festivals do pre-warn you, but listen to them. You aren’t the Incredible Hulk and your shoulders will feel as if they are collapsing as you trudge at a snail’s pace through the queue. Sure, once you have camped up it feels worth it but that shoulder and neck pain takes a while to sort itself out! Just think – do you really need to double up on outfits? The answer is no, no you do not. ENERGY BARS – now these are a God sent at festivals, I don’t know about you but I can’t quite seem to justify a tenner a meal every day. 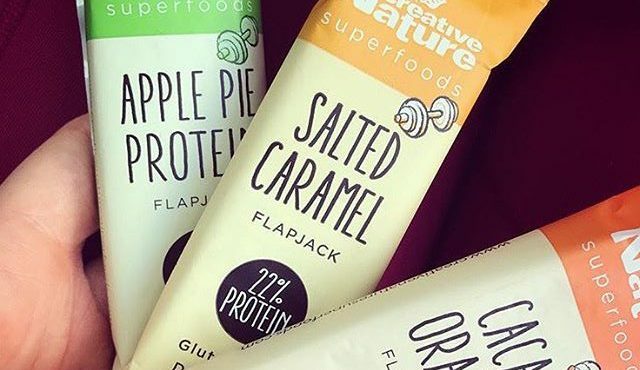 Just stock up on the energy bars – and what better ones than our very own Creative Nature snack bars – providing a tasty energy boost with a delicious texture. Your appetite seems to stay at home when you go to festivals so making sure you eat food in high protein and energy to keep you going is very important. DRESS FOR WEATHER – we all love to go a bit out for festivals, it’s the only time you can really wear whatever you like and not worry about anyone saying a thing, because you’re at a festival! But there’s nothing worse than feeling cold (which is the only way you will feel, I mean, we are living England after all) make sure you have a fleece packed away for when the frost starts to nip away! Last but not least – HAVE FUN – you’ve been waiting all year for it to come and now it has, don’t miss a moment, push your hangover away until home time, they aren’t welcome at festivals! You’re bound to come home a blubbering miserable mess, so why not save it all for then.